[GIVEAWAY] Ding Tea By Phybie Is Officially Open In Huntington Beach - EAT WITH HOP! I recently visited the newest Ding Tea to open in Orange County located in Huntington Beach run by a beautiful mother and daughter duo, Teresa and Phybie. This Ding Tea franchise is a bit different from the other locations (Westminster & Garden Grove) because it's probably the most spacious location so far with plentiful seating. Disclosure: This post is sponsored. No worries because I keep it real and all opinions are my own. This is the perfect study spot if you need to cram for a test (or just be a good student and study ahead!) or the perfect place to do work! The owners wanted it to be a good environment for studying so they are providing high speed internet and there are many outlets to plug your outlet in! This Ding Tea is across from Golden West College after all! Ding Tea is one of those boba shops one would get excited about. Heck, when I told one of my friends about it, she was excited too! Like.. yes! More locations are are springing up! Teresa, the co-owner, informed me that in the next few months Ding Tea will be expanding to more locations in Orange County and I am quite excited bout that. Of course, each location is gonna be a bit different because each is run by a different franchise owner so the interior design will be different but they all will focus on delivering great tasting drinks at affordable prices! Here are the hours for Ding Tea! This location is located in the same plaza as Smart & Final near Golden West College. And... here is what you are probably looking for: THE MENU! As you can see from their menu, their drinks are very affordable compared to other places with their most expensive drinks at $3.45 and cheapest drinks at $2.65. What a deaaaaal! I really love the story behind this franchise. The co-owners are a mother and daughter dynamic duo, Teresa and Phybie! Teresa has experience starting her own businesses at a very young age and knows of the valuable experiences one can learn through having your own business. So as a birthday gift, Teresa wanted to help Phybie gain valuable experience too so Ding Tea By Phybie is the result. The young entrepreneur, Phybie, is not one to mess with though. She used her social media marketing skills to help build awareness for her store, and the outcome was nothing short of success. On grand opening day, Ding Tea served over 1400 customers. That's just one day folks! What a fabulous grand opening! And the store is continuing to establish relationships with local businesses and organizations through fundraisers and events! Can't wait to see what else Phybie has up her sleeves for the future, because this young entrepreneur is definitely going places! I love the plentiful seating here. It's perfect for chatting with friends, studying or working on your laptop! HIGH SPEED INTERNET FTW here! 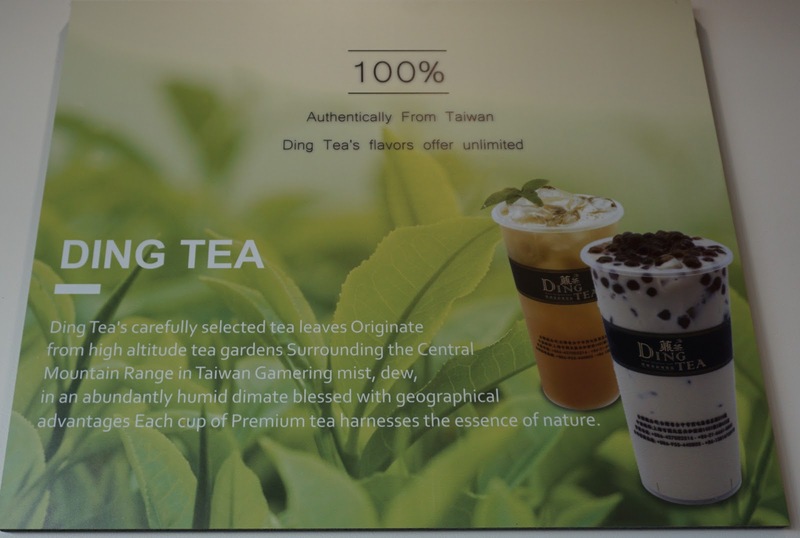 Ding Tea is a chain popular from Taiwan, the originator of all things milk tea and boba. So expansion to Huntington Beach is a great choice I think because that side of Orange County doesn't have many boba shops. The only competition I can foresee is the 7 Leaves Cafe and Tea Arias in the nearby plazas. And maybe... Coffee for 2 but the parking there is terrible anyway. 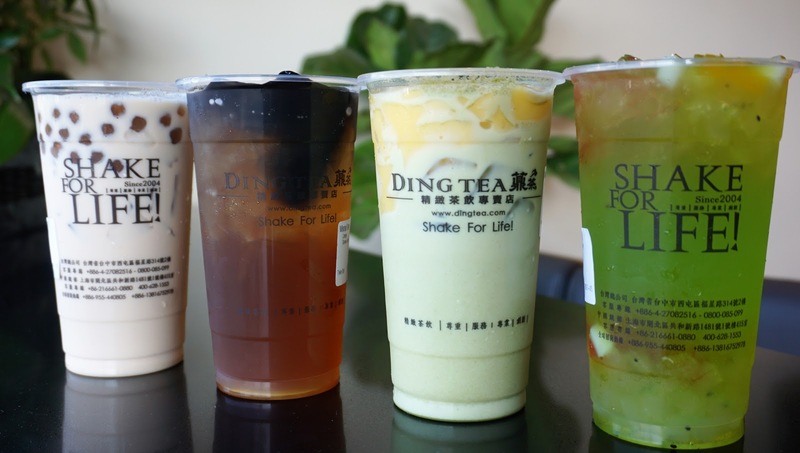 Huntington Beach now has another boba gem and study spot at least, thanks to Ding Tea! Why weren't you open when I went to GWC (albeit many many years ago)?!?! Wintermelon Tea with Sea Cream - Kevin really enjoyed this! Matcha Milk Tea with Egg Pudding! I LOVE THIS! My fave drink so far! Aloe Vera Kiwi Juice with rainbow jelly add-on. Fresh Grass Jelly in my cup. What more can I ask for? YUM! Matcha Milk Tea + egg pudding giving me strength every step I go. Especially that delicious egg pudding. So obviously you just order whichever drink you want. But I just wanted to point out specifically that here at Ding Tea, they are big on customizing sugar and ice levels! If you want no ice, then don't get ice! The drink will already be cold anyway because of the way they make it so don't get the ice! 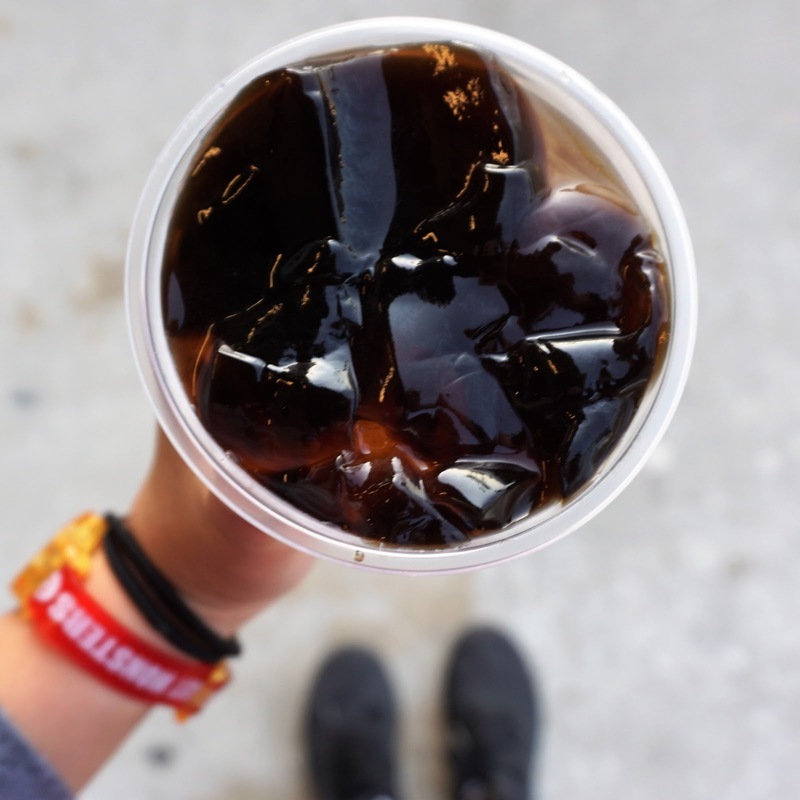 In addition to being able to not dilute your drink, you can adjust sugar levels! I personally think the drinks here are on the sweeter side so I would get less sugar (75%) instead of the normal 100%. But it's all up to ya and what your preferences are. I just like how they give options! If you love add-ons, they have several options! I didn't know what to expect when I got the matcha milk tea since y'all know I am particular about my matcha. But I was pleasantly surprised. The matcha milk tea here is imo better than Kung Fu Tea. KFT version is way too damn powdery and thick that it's hard to sip. Even after asking for adjustments it is still thick and weird. The Ding Tea version is actually a tamer version. A nice blend of matcha and milk that is balanced but you can still taste the matcha. And it tasted great with egg pudding! The one I got here also tasted like candy? I think it might have been from the egg pudding maybe? But it was unique and got me cravin` it all the time now. It sorta tasted like a burnt caramel candy / creme brulee sorta thing + matcha. Whaaaaat? Get it! I can't exactly explain what wintermelon tastes like but it's good. LOL Anyway, I'll try. It tastes kinda herbal-y and refreshing? So when I paired this with sea cream it was savory yet still light and refreshing. SO DELICIOUS! I didn't like hokkaido anything at first but then the flavor grew on me. It's sort of vanilla / caramel-y if that makes sense but anyway this is one of my faves now. I know a lot of people say that the Bolsa location is very slow with serving the drinks and getting people's orders so I am happy that the service here is much faster. You don't need to wait an hour for yo drank. No prob. Also, everyone here is so friendly and nice! And they'll make sure to get yo order correct! The store here is spacious with many tables and seating. Upon entering I sense more of a chill study vibe here because there were already people just sippin` milk tea and on their laptops working. So I would say it would be a great study spot! Plenty of outlets. Their Wi-Fi is HIGH SPEED too! Drinks here are definitely affordable and I think that's one of the reasons why it's so popular for many boba lovers. Drink prices range from $2.65 to $3.45. No worries about parking here because the location is in a big plaza with lots of FREE parking! Follow the Eat With Hop! Blog on Facebook and Instagram for more updates! Click this link to enter! Ends Wednesday 9/20 at midnight. Tag a friend in the FB post to enter. Ends Saturday 9/30 at midnight. *Picking 2 winners | Giveaway ends October 31! Have you been to Ding Tea before? What is your favorite drink or what would you wanna try?! 2. (Optional) Follow Ding Tea HB on social to stay updated! GIVEAWAY WILL CLOSE ON HALLOWEEN (OCT. 31) | 2 TASTE BUDS WILL BE E-MAILED FIRST WEEK OF NOV.